just a slight difference in price. Nevertheless, flights and hotels will be your biggest expense, when travelling to Lithuania, as everything else like food and entertainment in Lithuania is relatively cheap. The flight prices drop during the winter with the exceptions of the Christmas and New Year holidays. When it comes to cheap flights to Vilnius and Lithuania you can come across some good deals when booking a package holiday of a flight and hotel together. In our experience of travelling to Vilnius, overall we found that ebookers.com offer the best discount packages, flights, hotels, and car hire. 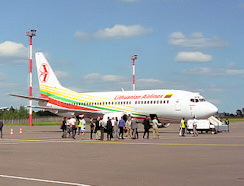 Only flights within Europe take off and land in Vilnius airport. There are no direct flights from the US and Australia to Lithuania, it requires a change of plane. Lithuania has cheap air links with Warsaw. Vilnius International Airport is the biggest airport in Lithuania. Still it is relatively compact, therefore it doesn’t take long to go through immigration and customs and the baggage arrives quite promptly. There is a 24-hour currency exchange and an ATM inside the airport. 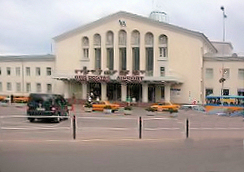 Vilnius airport lies just five-km from the centre of the city. The fastest and most convenient way to get to the city is to take a taxi from outside the arrival hall. The ride to the city centre should cost you around 11.50 €. Some accommodation companies arrange to pick you up from the airport on your request.